What, a Lemony Snicket picture book? Oh please, pretty please, may I have one? The publisher not being the usual sort to make the kidlit blogging circuit, I had no idea if a review copy would be forthcoming. It was. And, joy of interfaith joys, the book is indeed wryly funny and lightly philosophical, and by this I mean that it gets its point across without bruising you with repeated beatings. Its billing as a Christmas story should alert Jewish readers that the story isn't necessarily aimed at them; it's designed to give Christians a feel for being on the outside looking in. By now, many people will know that Snicket is the pseudonym for Daniel Handler, and his wife illustrated this stocking-stuffer-sized book about feeling left out, misunderstood and literally out in the cold. "This story ends in someone's mouth, but it begins in a tiny village more or less covered in snow." The reason I wrote "Box" was that I had read a book by Blu Greenberg in which she wrote about the organic flow of the Jewish year. I went to the library to find a picture book that expressed that feeling for my daughter (this was years ago--she just turned 13). I didn't want anthologies or sentimental takes on shtetl life. I wanted a book about a living, breathing Jewish family and what it felt like for that family to celebrate a year of holidays. I couldn't find that book in libraries or bookstores, so I decided to write it. I worked on the story for years and then spent more years trying to get it published. All the Jewish houses turned me down. It didnt' fit in with their program. They do holiday books or holocaust books. They don't like books they can't pigeonhole easily. (I've even had librarians tell me that they really liked the book but were worried about where they would put it. It's not a Shabbat book, it's not a Hanukah book. Such problems! ) Boyds Mills Press did this book because, bless their Lutheran hearts, they saw it as multicultural. This year, the book won the National Jewish Book Award in the brand new category of family literature. I was thrilled to accept that award for myself but also for BMP because they took a chance doing it. So there you have it. It took Protestants to break the mold of Jewish stereotypes. I don't know why I'm not surprised, but in any case I'm mighty pleased. Thanks, Laurie, and Mazel Tov on your award. A complaint I've been hearing from Jewish families lately: there aren't enough good books about us that aren't idiotic primers on the holidays or -- gag -- about the Holocaust. You'd think since we own the media (just kidding) the big publishers would stop cranking out kids' books that treat us as exotica or as history's redheaded stepchild. And I've heard it unprompted from enough families to know that I'm not merely injecting my own disgust into the conversation. 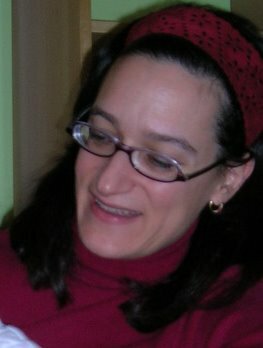 Jews are as mainstream as anyone else today, so where are the stories about mainstream Jewish families? Ones that don't have numbers tattooed on their arms? I finally fished out this story of one family's rediscovery of love though it was published last year. Yes, it takes seven-year-old Ruthie, Sabbath by Sabbath, through the cycle of Jewish holidays. But she also comes full circle from her hatred of a new neighbor, Mr. Adler, who competes for her grandmother's attention. Love is sometimes like a weed, growing surreptitiously between the cracks in our defenses. So it is with Ruthie, who finds in Mr. Adler a hearty storyteller and jokester who includes the little girl in his courtship of Grandma Gussie. 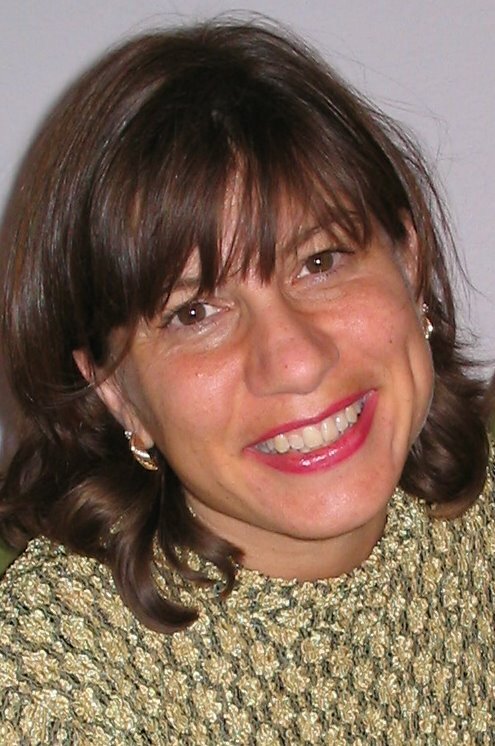 She's won over and so are we, and along the way we get a glimpse of how an observant family goes about readying for Sukkot or Passover or even just a typical Sabbath. Judaism, in other words, is woven into their everyday lives, and never treated as "hey, look at the weird stuff Jews have to do!" Schonenbaum Ephraim's watercolors have frames drawn around them, as if creating an unobtrusive window into Ruthie's world. A glossary explains terms that would be unfamiliar to non-Jews, but perhaps not. I'm often pleasantly surprised by how much gentiles know about my faith. At least somebody's reading all those primers about our holidays. In this embarrassing non-story about a Passover seder, we get cutesy rhymes about cutesy toddler antics and cutesy doggy antics and a few vague references to the actual purpose of the gathering. It's useless for instructing kids and isn't fun as a story. The ritual foods on the seder plate are explained in endnotes, but there's no reference to Egypt or Moses. Worse, matzoh ball soup and gefilte fish get prominent mentions. Oy. These are Eastern European foods; a Jew of Mediterranean or Middle Eastern pedigree wouldn't recognize them. The rhymes are trite and the meter's off. The art at least avoids the more stereotypical renditions of Jews, but the exclamation point in the title bugs me. It might've been salvageable had the story been titled Afikomen for the broken matzoh that gets hidden and prompts a treasure hunt. Its discovery marks the official end of the meal. At least that wouldn't have raised our expectations of something more. Think of this book as the Jewish equivalent of a stocking stuffer: just a little something to tuck away as a surprise gift for someone still too young to play with matches. No danger of setting their clothes on fire with this one, as Yoon playfully pointed out to me in her cover note. 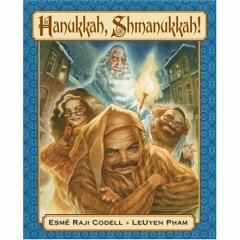 Each page has a glittery candle, and as you turn the pages, the Menorah adds another sparkly flame for each of the holiday's eight nights, plus the "shammash" helper candle in the middle. It lights correctly -- from right to left -- requiring a clever layout with text on the right, the Menorah on the left. The text's a tad repetitive, with the word "celebrate" overused, but this is a minor quibble. The book's still a charming and simple way to teach about one of Judaism's most famous symbols. I should stop reading press releases. They, well, de-press me. This one was chock full of blurbs by such literary heavyweights as Nobel laureate Eli Wiesel (“will bring the city closer to you”), Cynthia Ozick (“the very hues of Paradise”), even Maurice Sendak (“fierce bite, healthy spirit and sheer joyousness”). You’d think Solomon, Jesus and Mohammed all co-wrote it. So who am I to criticize Podwal, whose paintings hang in the Metropolitan Museum of Art and who’s a medical doctor in his “spare” time? Not to mention all the fancy fellowships and awards he’s received. I take it Podwal couldn’t write a bad book if someone mugged him and stole all his ideas (hey, let ‘em blurb that). that fell from God's throne. The book doesn’t name names: no Temple Mount, Church of the Holy Sepulchre or Dome of the Rock, nor is there room for a discordant note in this lyrical poem. We get to pretend all three faiths can actually coexist in pastel-hued, light-infused impressionistic harmony, at least for 30 pages. Dang, I’ll never get blurbed at this rate. Okay, here goes: Moving tribute! Transcendent art! Message of hope, etc! Nice if you’re into this sort of thing! We never see the face of the narrator as he makes his way through exotic, dangerous lands. He’s viewed only in profile or from behind, an enigmatic figure who weeps into his cloak before the gates of Jerusalem or ruminates among the ruins of Rome. 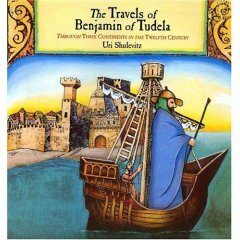 Nothing is known about Rabbi Benjamin, a Jew who left his native Tudela, Spain in 1159 for a 14-year journey, except for what he wrote in his travelogue, one of the only surviving accounts of a time that straddled the ancient and modern eras. He became the first European to bring back rumors of a country far to the east called China, and painted a complex portrait of Medieval Jewry as it perched precariously between Christians and Muslims during the time of the Crusades. He described pageants and pirates, and bore witness to the mystical and the miraculous. Now try translating this real-life epic into a story readable to young children, and illustrating it in a way that does it justice. How would you do it? Shulevitz converts the tale into a first-person narrative and fills in gaps such as what documents Benjamin carried or the hair-raising hazards he faced on the road or at sea. However rich the narrative, the illustrations lift this to the sublime. Shulevitz borrows different techniques and styles to fit the story: Constantinople shines as if lifted from a Byzantine mosaic; an impressionistic rendering of the Sahara shimmers with heat. Shulevitz received a Guggenheim fellowship to partly retrace Benjamin’s path. You can see how it must’ve paid off in such knowing, precise details as the spires above Baghdad or the narrow alleys of Tudela. This isn’t merely a guide to architecture of the Middle Ages, but a tour through the imagined heart of a determined pilgrim.